Stop The Pain of Bad Relationships! Communication isn't the only thing that determines whether your marriage ends in divorce, or your relationship fails, but it's probably the MOST important part, or at least, that's what the research says. Fortunately, you can learn how to improve how you communicate with those people who are important to you, whether it's a husband, wife, boy or girl friend, or even other family members and co-workers. We believe this issue is SO important that we've made Imperfect Phrases For Relationships FREE to read online. It makes no difference whether we're talking about a marriage, a dating relationship, or a relationship with friends and families, there's no mystery about how to build better ones. Of course relationships are complex things, but we DO know that one of the easiest ways to improve or build better relationships is to pay attention to, and make small, easy modifications to what couples SAY to each other. Yes, it's true some relationships cannot be improved without more in-depth help, but it's also true that when you change how you speak -- what you say to each other, and eliminate the relationship killing words and phrases you both use, that your relationship WILL improve. If you use words that insult, demean, or are verbally abusive, even unintentionally, your relationship will fail. If you replace "bad" language -- we call it confrontational language, with cooperative language, you can say almost the same things, but without causing the hurt and pain resulting from confrontational language. We KNOW what kinds of words to eliminate to have beter relationships, and best of all, it's not difficult to fix the problems once you know how to do it. We've developed a tool that will teach you some basic principles of effective communication to stop the pain and frustration in your relationships. More important, we've listed 101 destructive phrases and words you should never use in your interactions with the people close to you, AND we tell you how to replace those bad phrases with good ones -- words that will build bridges, increase rapport, and help you reduce arguments. 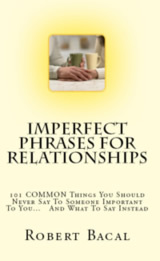 Our book, Perfect Phrases For Relationships - 101 COMMON Things You Should Never Say To Someone Important To You and What To Say Instead, is low cost (under $15.00). The best is that you can read it free, right now, online. It's all here. Reduce unnecessary arguments with your husband, wife, or family members, just by learning to use the right words. Stop putting your "foot in your mouth" and regretting what comes out of your mouth. Learn to communicate without hurting others at your own speed. People say hurtful things that cause stupid arguments, not because they want to fight, but because they don't realize the language they use will cause the other person to react badly. By eliminating and replacing the 101 ImPerfect Phrases you CAN improve your relationships almost immediately.